The instruments in his repertoire include guitar, melodica, bass drum, slide whistle and tambourine. MUMBAI - Indian musician Gladson Peter strums the ukulele while blowing into a harmonica and smashing a cymbal using his foot as children from one of Asia's biggest slums clap and cheer. 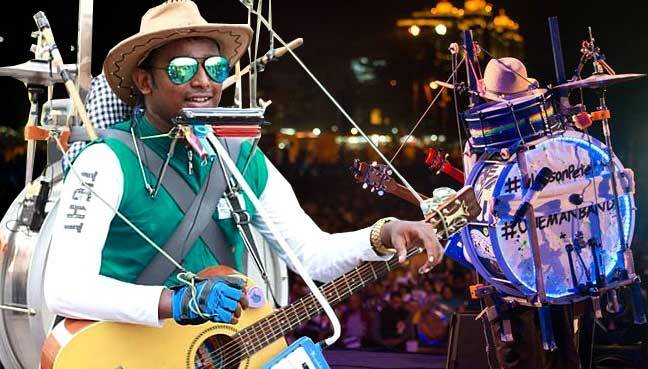 Peter, who can play 45 instruments, claims to be India's only one-man band and enjoys something of a fan following for his renditions of popular songs, including Ed Sheeran hits. The 24-year-old, a keen musician since the age of three, performs to raise awareness about the dangers of passive smoking after he lost part of a lung as a teenager. "My shows are the hook through which I share my messages that can change someone's life. Many people have come up to me and apologised for tobacco consumption and have quit smoking," Peter told AFP. At college in his late teens two holes caused by tuberculosis were found in one of his lungs. Peter feared that he would never play wind instruments again. Doctors said the disease could be exacerbated by passive smoking. So last year he decided he would form a one man band, playing 11 instruments, as part of his own anti-smoking awareness campaign. "We built the equipment in a week, rather miraculously, and I kickstarted my performances," said Peter, who has since played around 200 concerts across India. He now plays 13 at once using a kit that weighs around 25 kilogrammes, no mean feat given his weakened lungs. "Though I cannot even run half a mile, my faith keeps me going and when I wear all the instruments and become the one-man band I feel empowered," he said. Indian musician Gladson Peter strums the ukulele while blowing into a harmonica and smashing a cymbal using his foot as children from one of Asia's biggest slums clap and cheer.